Easter Chocolate, Gifts, Baskets for Everybunny (sorry, had to)! Easter is just around the corner so we’ve put together the Ultimate Guide to the best Easter chocolate, Easter gifts, and Easter Baskets for adults and kids with exclusive discounts and coupon codes! You’ll find something here for everyone on your list (including YOU!) with pricing to fit every budget, from thrifty to luxury (seriously). We’ve picked the best of the best Easter chocolate available online so you don’t have to spend hours looking for that perfect gift. This post contains affiliate links. Hoppy Shopping (sorry again) and Happy Spring (finally)! These cute Easter themed paint cans filled with Hershey’s Kisses, pastel colored Kisses in bulk, and Happy Easter gift box with chocolates and toys are from Old Time Candy. Easter Sitewide Savings – Save 20% off all Easter candy & candy Site Wide too! Use Code: HOP20 at Checkout! Give a gorgeous Golden Egg for Easter (new!) from Dylan’s Candy Bar. Inside is a cute stuffed bunny with your choice of Chocolate (brown bunny) or Vanilla (white bunny) and some Easter treats. Or choose their Easter Extravaganza basket filled with yummy treats like Cookies n Cream popcorn and lots more, or choose from other sumptuous gifts. Get 20% off the Easter 2019 Collection at Dylan’s Candy Bar. Use code CUDDLEQ1 to save through 4/15. Enjoy amazing Easter treats with Southern charm from Savannah’s Candy Kitchen. 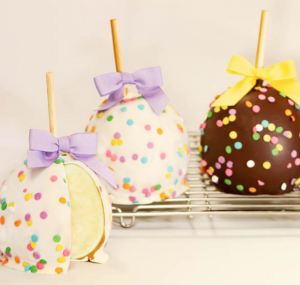 Get the Hoppy Easter Gift Box, Spring-themed white and milk chocolate caramel apples, or the Easter Bunny Pail. Check out these incredible Easter Gifts from Giftbasket! You can’t go wrong with this Godiva Chocolate Bunny Basket, or the excessively cute Ladybug Tower, or classic Easter Chocolate Delights Basket, plus many more to choose from! Use Coupon Code Bunny15 to get 15% off on all baskets through 4/30/19. Jamie Foxx recently visited the EthelM Chocolate factory in Las Vegas and happily stated “the chocolates are divine.” https://twitter.com/EthelMChocolate What more do you need to order the perfect Easter gift from a company who’s been making chocolate for over 100 years? Choose from the 10-piece artisanal Easter Egg, or choose your own assorted chocolates with the Easter Box or Easter Egg. Get 15% off any purchase with code YAS15. Check out some of the adorable new Easter items from Russel Stover Chocolates! Get a chocolate bunny that’s a full pound of solid milk chocolate, choose an assorted box with Spring and Easter packaging, or a Cocoa Plush Puppy with a smaller solid chocolate bunny. If you’ve never had gourmet chocolates from France’s zChocolat, you are in for a treat. Through 4/21/19, choose from the Easter Chocolate Pralines, Peace Solid Chocolates, or Chocolate Eggs. Luxury Easter chocolates from zChocolat! Put together your own Easter Basket with these classic favorite selections from Amazon. From Lindt Chocolate Carrots, to Reese’s Peanut Butter Eggs, to a Mars Variety pack, including Snickers, Twix, 3 Musketeers, m&ms, and Starburst candy. See all their Easter Candy and chocolates. If you’re looking for Easter Baskets that are already assembled and stuffed with gifts that are easy to ship, here are some more fun options from Amazon. Send a 30-piece Purple Easter Basket that also includes activities, or a classic green Easter basket with a stuffed bunny, chocolate, Peeps and more. Or, send this 40-piece Easter Care Package containing chocolate, toys, and snacks! Easter celebrations don’t start around the PSC office unless there are See’s Candies on the counter. Their Bordeaux Easter Egg must be on your “10 things to eat before I die” bucket list. It’s that good. If there’s a cat lover in your life, surprise them with this cute kitty Easter box of assorted chocolates, or give yourself a mini tropical spring break vacation with a nice Cocoanut Chocolate Egg. And last, but certainly not least, we have delectable Ghirardelli Chocolate Easter treats. Try the new Bunnies and Eggs collection, or the precious Milk Chocolate Caramel Bunny pack, or Dark Chocolate Sea Salt Caramel Bunnies. We usually have a bag or two of Ghirardelli chocolate handy, and will definitely be getting some of these! 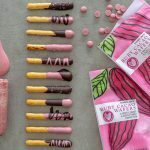 That wraps up our favorite chocolate picks for Easter 2019. We hope you enjoy some of these treats and have a wonderful Easter celebration! p.s. See more of our chocolate recommendations for every other day of the year.